My sweet cousin, Maddie, turned sixteen last weekend. I can’t believe that she is sixteen. It seems likes just the other day she was the flower girl at my wedding, but that was ten years ago. Maddie is such a great teenager. She seems so much more mature than I was at that age. She can talk to adults and can see when the other teenagers around her are acting like idiots. She is more of an individual than most teenagers, in my opinion. And to top it all off, she is beautiful and kind. Even at her surprise birthday party, she made time for Faith and let her sit with Maddie and her friends. The party was graciously hosted by some of Aunt Lisa’s friends. 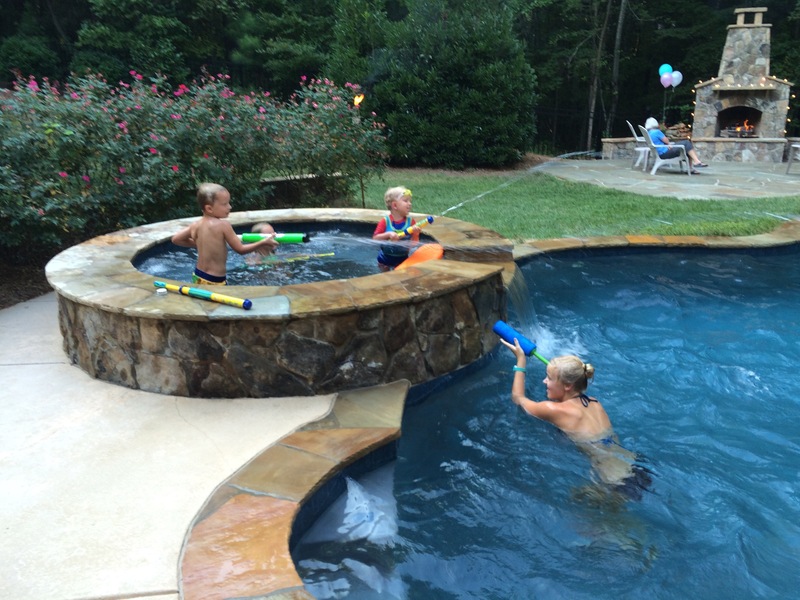 The teenagers swam in the pool and then had a water gun fight that was started by Wilson and Maddie’s friend, Carson. This was the highlight of Wilson’s week! He loved the fact that he could squirt teenagers with water and they would try to get him back. He lives for this stuff! Happy Sweet 16 Maddie! We love you! This entry was posted in Uncategorized on August 25, 2015 by Becca. 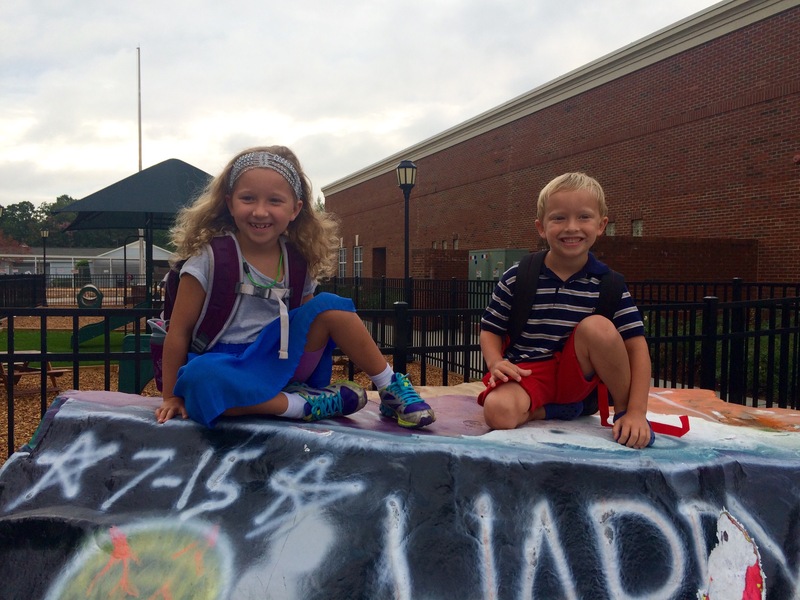 Today we began a new chapter in the kids’ education – Faith and Wilson both had their first day at Metrolina Christian Academy in Indian Trail, NC. 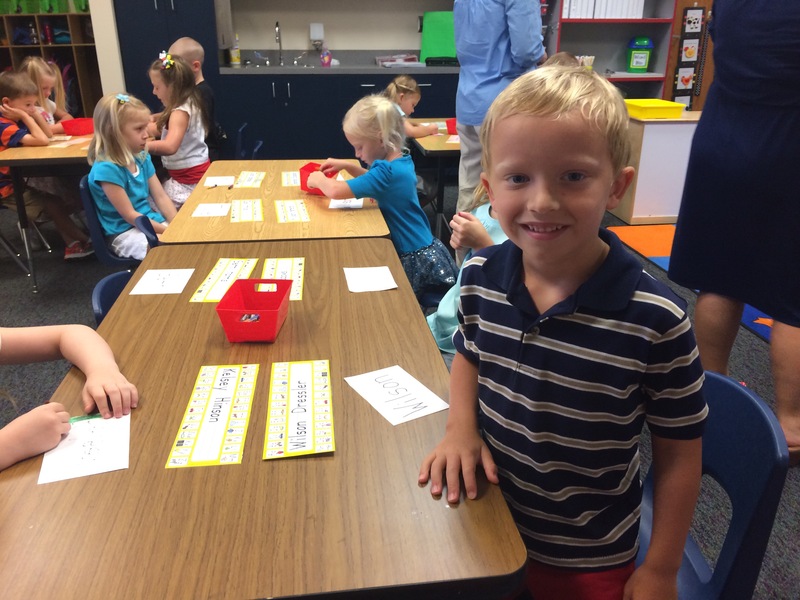 Wilson was very excited to begin kindergarten. 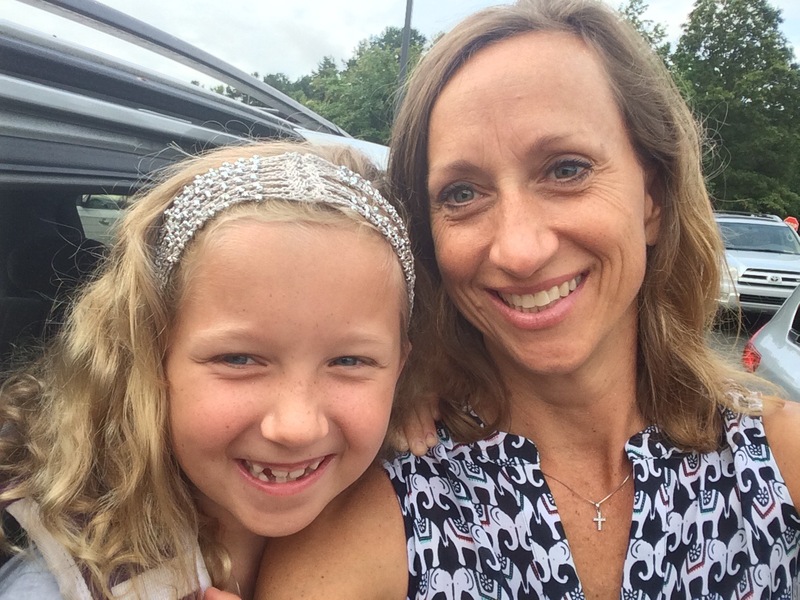 I had no worries about him adjusting to his new environment – he is very social and loves school. I had almost glaced over the fact that he was indeed starting kindergarten and another one of my babies was leaving the nest. I think that I was overlooking it because I was so concerned about Faith and her liking her new school. For weeks she has been telling me that she was scared and that she just wanted to go to Covenant Day (her old school). I felt so horrible that I was taking her away from her friends and putting her into a new situation where she knew no one. She is so shy and timid, and I could truly empathize with how she was feeling and it made me sad. At one point I regretted enrolling them and thought that we should have homeschooled so that I could be with them more and so that I could protect Faith from scary situations such as this. I cried for her this morning when we dropped off the kids, but felt joy when I saw Wilson run into his classroom ahead of us. The funny part of this story is that last night when I went to drop off Miller at my parents’ house so that he could spend the night (and we could have one less child to get ready this morning), Miller wanted to stay with me and Faith and Wilson wanted to sleepover at my mom’s house. Surprisingly, Tom and I let the two of them sleep at my mom’s while Miller came home with me. It was a blessing in end because I could easily put Miller to sleep, pack lunches, and wake up effortlessly in the morning ready to go. We picked up the kids at 7:15am and all drove over to Metrolina. We took a picture of Faith and Wilson on top of the birthday rock. 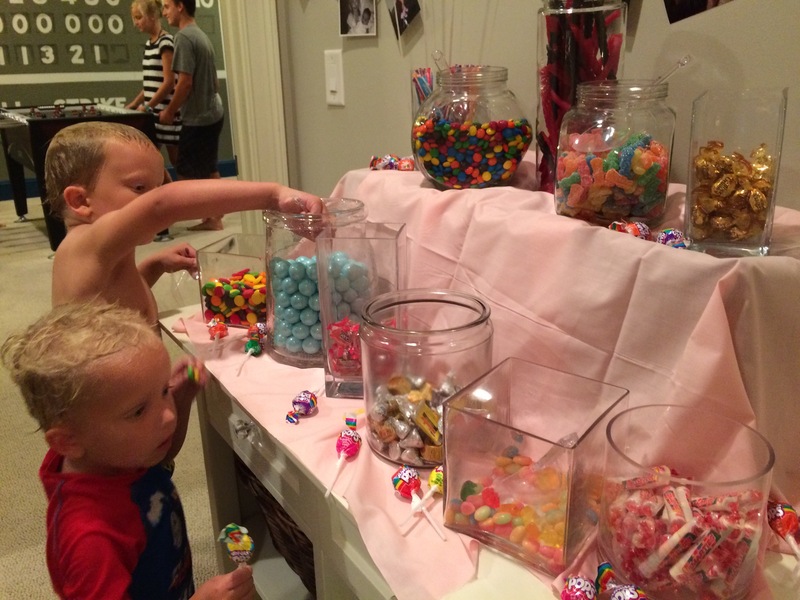 Maybe a new tradition…. Faith and I did a pre-school selfie. We were ready to go in, together…. Wilson was so excited for school that he was almost running down the hall towards his classroom. I even heard Tom say, “Don’t run anyone over!” as he chased Wilson through the crowds. He wore his favorite shirt and shorts for the special occassion…. Those are both two very good signs that we made the right decision when it came to choosing a school for the kids. It was a positive ending to a sad (for me), exciting (for Wilson) and scary (for Faith) morning. This entry was posted in Uncategorized on August 20, 2015 by Becca. Sundays are supposed to be a time of rest and preparation, a sabbath. Last Sunday started out as such, but it quickly went downhill the moment we were told that the buyers of our house backed out. They simply just changed their minds. This meant that we couldn’t continue with our plans to buy the next house that we wanted to purchase. Immediately we started scrambling to come up with ideas that would allow us to keep moving forward with our plans – Do we get a realtor? Can we buy two houses? Could we rent ours out? Would the owner be merciful and give us more time? So many unanswered questions and very stressful. Up to this point things were going so smoothly that this huge speed bump really through me for a loop. I think I spent most of Tuesday on the porch talking on the phone to my buying realtor, a new finance person, and many other people. We even met with our new selling realtor Tuesday night. We know that we want to move and are now motivated enough that we are going to hire a realtor to sell our house (up to this point we have been trying to sell it ourselves). The stress increased a bit on Wednesday when Tom left town to work for three days. Thankfully, the kids were amazing! They played so well together all week. We had a “stay at home Tuesday” that went so smoothly. So while I spent the day on the porch, the kids played cooperatively inside. Faith played with her dolls and Wilson and Miller played with the racetrack. This summer has given Wilson and Miller a chance to solidify their relationship. Miller is now old enough to play the games that Wilson wants to play and to cooperate a bit more as well. Of course, they argue daily, but they play together joyfully much more than they argue. For example, I heard them arguing about how to set up the race track and Wilson finally said, “Miller, just let me try it my way and if it doesn’t work then we will try your way. Ok?” Miller said, “Ok, Wilson. Good idea.” And then they went back to playing. It brings me such joy to hear them getting along and enjoying each others company. They will be lifelong friends and that relationship is being built right now. The rest of the week went about the same way – the kids played together while I did work intermittently. I have to say I became a bit more grumpy as the week wore on, but nothing I couldn’t handle. We spent Thursday afternoon at the pool with Sidney and some other friends. We didn’t even leave until after 6:00pm, which made for an easy bedtime. Even with the stress of the week, I thoroughly enjoyed being at home with the kids. I will miss them terribly when school starts. Most parents look forward to school starting again, but not me. I love having them at home with me. I also love not having to make lunches, do homework and get everyone out the door at by 7:30am. I will miss summer! As for the house – stay tuned. It goes back on the market today and we will see how quickly it sells. I pray that it will take less than two weeks. This entry was posted in Uncategorized on August 13, 2015 by Becca. We go to a small church here in Charlotte. We are very thankful that there are three other families that go to our church that have kids the same ages as our children – the Youngs, the Nances and the Warrens. 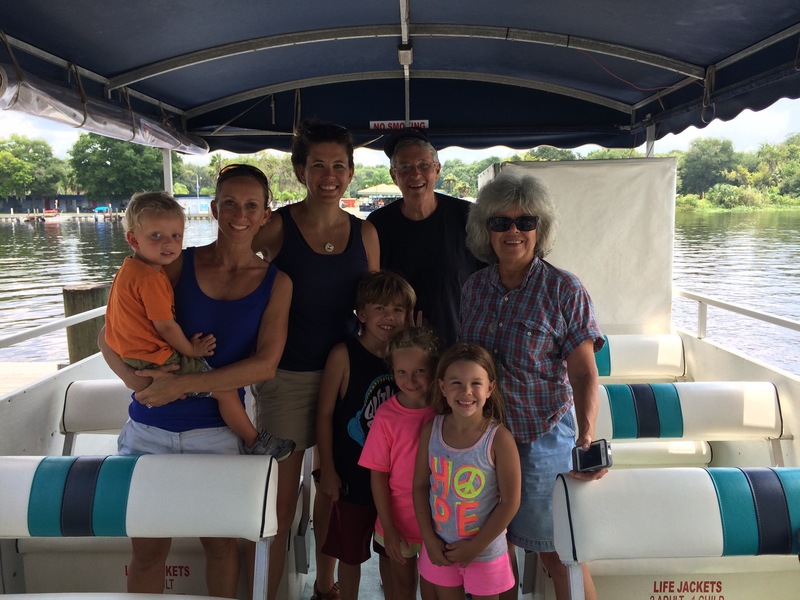 On Saturday, Jimmy and Kristie invited all of us up to their lake house on Lake Norman. It was a great day to be outside – a cloudless day and below 90 degrees. My kids had only swam in a lake once before and I thought that they would be a bit leary of the water, but they jumped right in, even Faith. It was fun to look out by the dock and see ten children all swimming around in life vests. 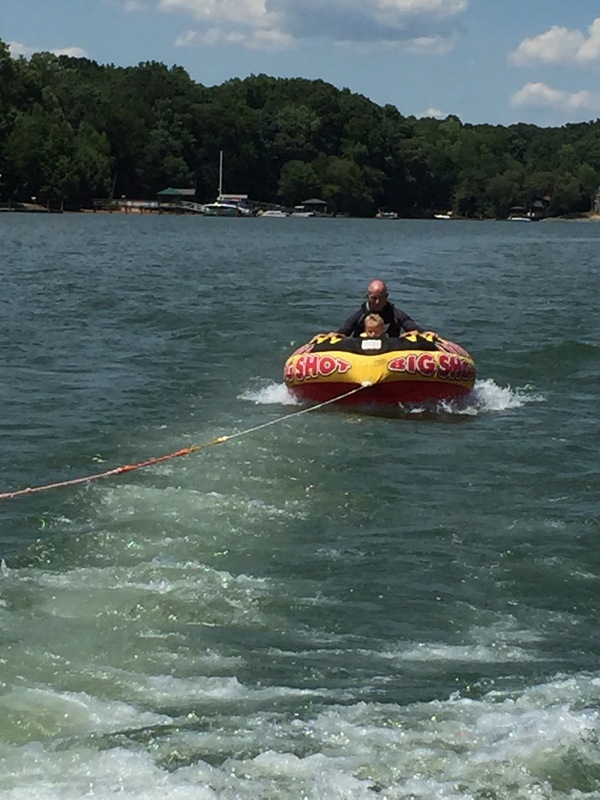 Jimmy took us out in the pontoon boat so that we could pull the kids in the tube. The kids were all young so the adults took a turn with them. Even little Miller got into the tube with me and loved it. I was proud of the kids for doing something new and not being scared. Everyone got a chance to drive boat. I think that was one of their favorite parts. Jimmy and Miller…. Jimmy was even brave enough to let some drive without him standing next to them…. 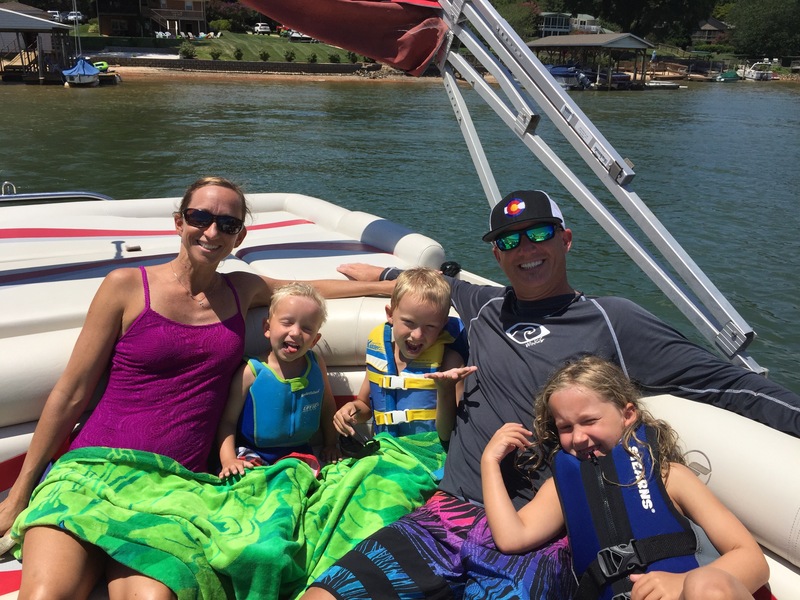 We loved being at the lake and spending the day with some great friends. We were there for many, many hours talking about kids, church and life. Jimmy and Kristie were wonderful hosts. I know that we all hope to do it again sometime very soon! This entry was posted in Uncategorized on August 2, 2015 by Becca. Last year Sidney and I took the five kids down to Florida to visit her parents. The trip was such a success that we decided to do it again this year. We packed up her two kids, my three kids, and all of our stuff into the car last Monday morning and set off for Deland, Florida. It is an 8-9 hour drive to her parents “ranch”. Honestly, I know it sounds crazy, but the drive really wasn’t that bad. 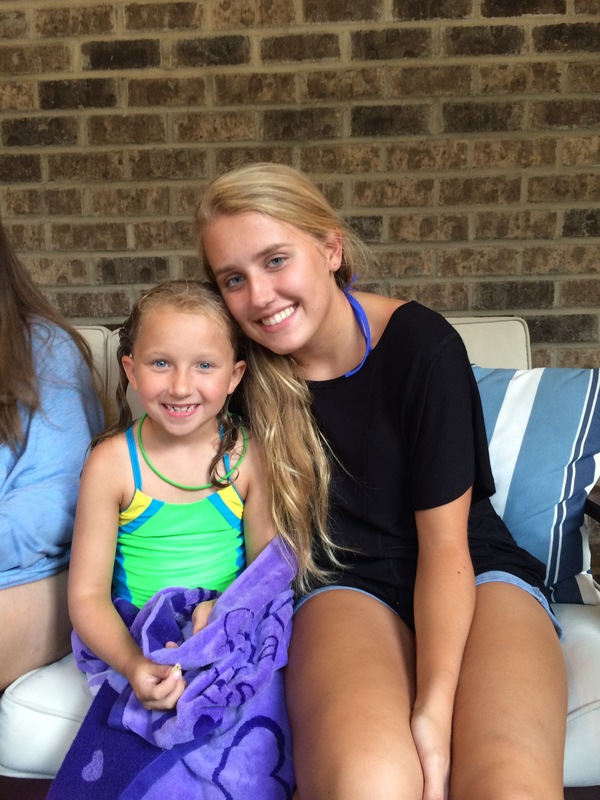 The kids love to be together and they get along very well….and so do Sidney and I. We drove down on Monday and came back on Friday so that we are gone while the men are working during the week. Perfect! This year we trekked it over to the beach twice instead of once. 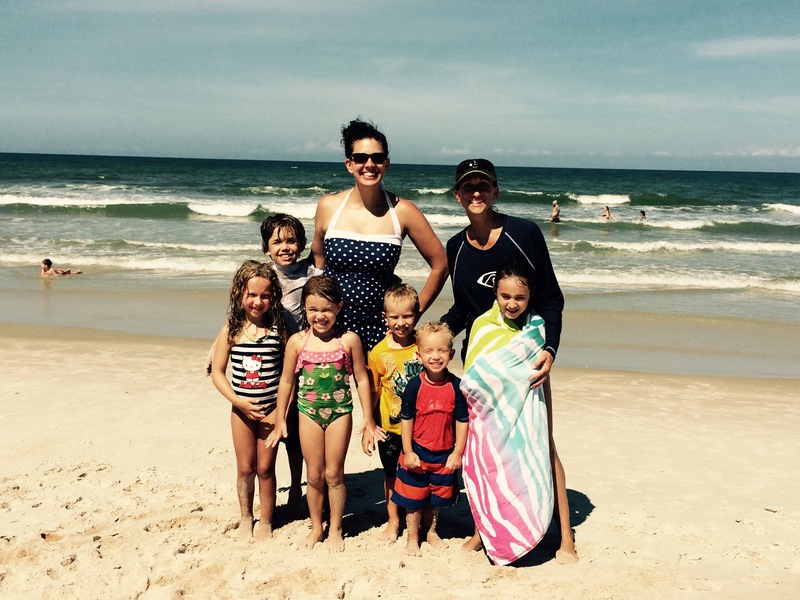 The kids love the beach and they rarely get to go. The first day that we went it rained the whole time, but it didn’t seem to bother anyone so we stayed and played in the rain until the thunder came. The second day was beautiful. We were there for many hours and when it was time to leave the kids wanted to stay even longer. Being at the beach is so refreshing. I love to stare out at the water and be amazed at the vastness of it. 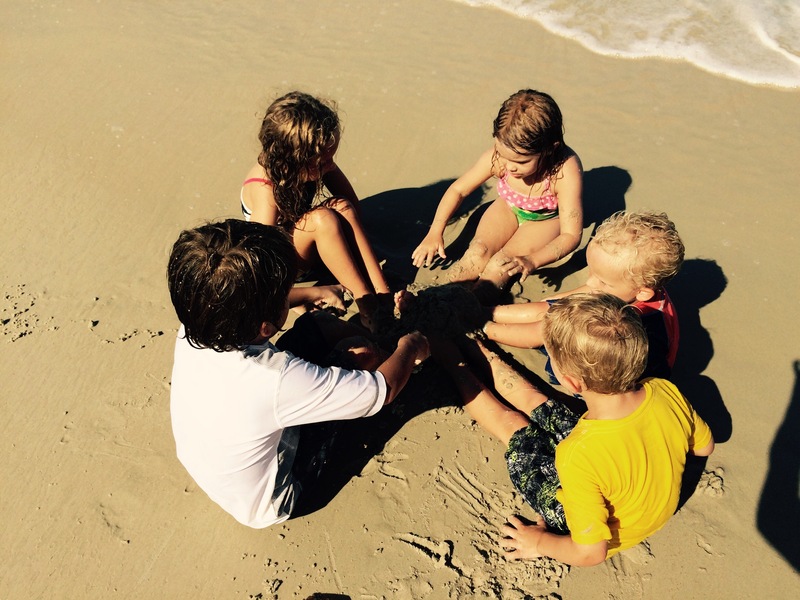 It always reminds me of how powerful and creative God is, and in turn, helps me to reflect on how blessed I am to be healthy and alive….not to mention that I love to play in the water and dig in the sand, just like the kids. The kids buried they feet in the sand… It was Yibbit’s birthday while we were at the ranch and she decided to take us all on a river cruise. The boat floated through the river and out into Lake George. 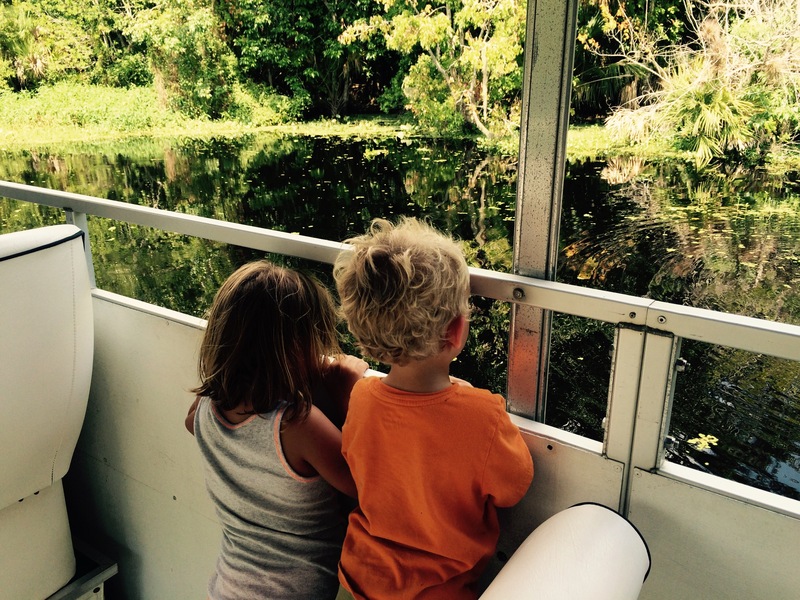 We were able to see a few alligators, herons, turtles, etc. It reminded me of going to the everglades when I was little. I really enjoyed it and so did everyone else. Our small gang for the week…. The days we spent in Florida were very relaxing. The kids swam in the pool, I got to sleep in most mornings, I ate well, did very few dishes thanks to Tom, had interesting conversations, enjoyed wine with dinner, spent time with good friends, and got away from my everyday routine. What more could a girl ask for?! 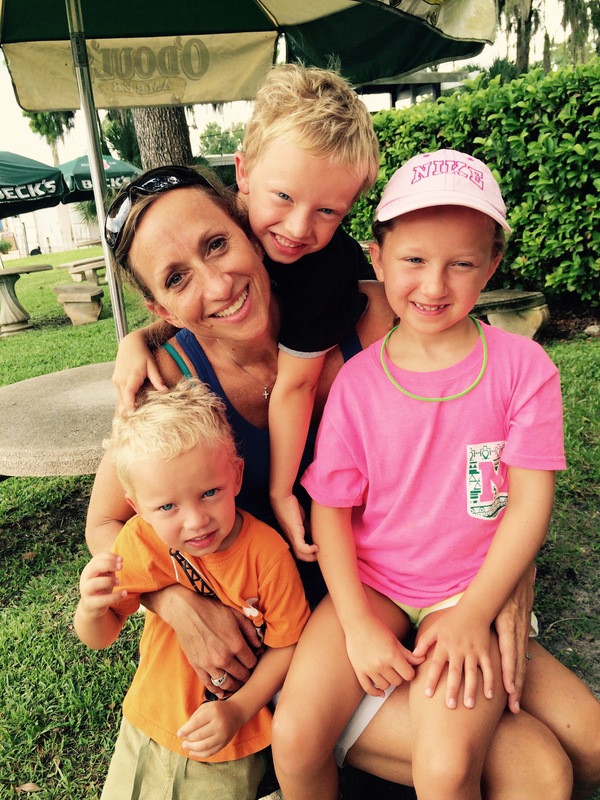 This entry was posted in Uncategorized and tagged Beach, florida, ranch, shelton, sidney on August 1, 2015 by Becca.